I am evaluating a kiteboarding accident regarding which I would appreciate your opinion. 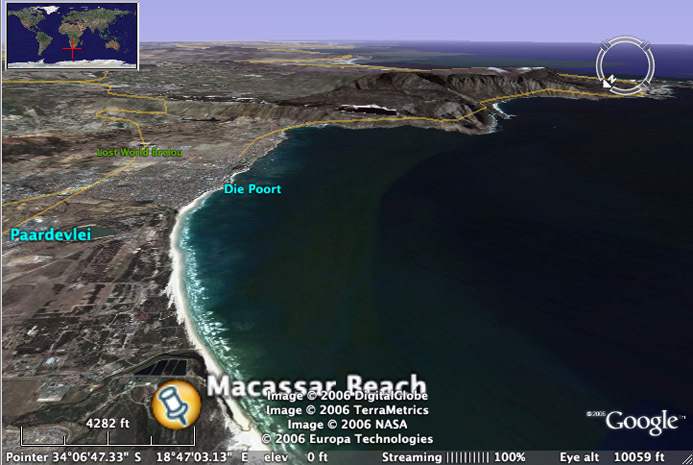 It occurred at Macassar Beach, False Bay, South Africa just outside Cape Town on October 18, 2006 at about 3:30 pm. It involves a 33 year old male, 1.8 m in height and 120 kg. in weight (5' 11" and 264 lbs.). The man was apparently overweight but was not noted to become out of breath easily with exercise. He was reportedly not on medication other than a weight loss product, USN Phedra Cut* He had apparently only just started to use this product which requires regular hydration which the victim was noted to be doing. Neither the man nor his family apparently have a history of heart problems. The victim reportedly had a cold a few days before but was not demonstrating obvious symptoms on the day of the accident. He was also stated to have had chronic back and sinus problems. He was using an as of yet unidentified sinus medication but apparently no other preparations for his back or cold. The side to side shore wind conditions were averaging 20 to 25 kts. gusting in sudden bursts to perhaps around 35 kts. with lulls to around 20 kts.. 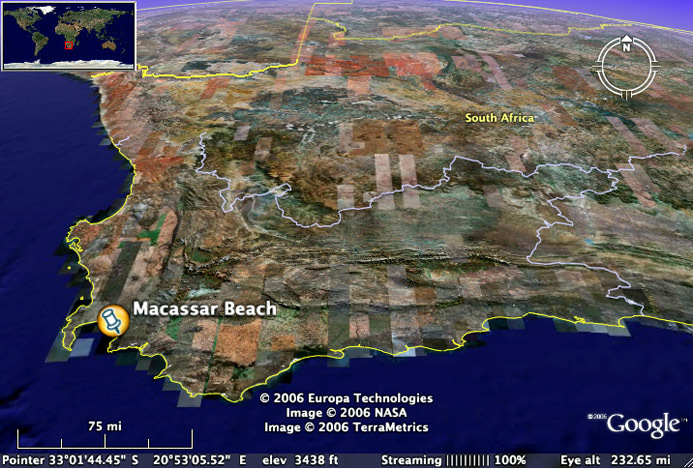 The air temperature was about 25 C and the water temperature was perhaps around 15 C (77 F and 59 F). The victim was in a full wetsuit of unknown thickness. The rider was in waist deep water with seas in that area at around 3 ft. He had taken a few lessons in another city and was working on learning to water start on his board the day of the accident. He was flying a 12 m flat kite. A view upwind to the southeast towards the Sir Lowry's Pass mountains. These mountains are about 1100m above sea level (ASL), in the higher areas. SE winds would be blowing over the lower mountain area to the north, probably between 700 - 900m ASL. These mountains can create violent gusts and lulls particularly further to the east along The Strand in easterly winds. The kite fell to the water at one point and upon relaunching proceeded to loop, hit the water and loop again pulling the rider along probably at a high rate of speed. 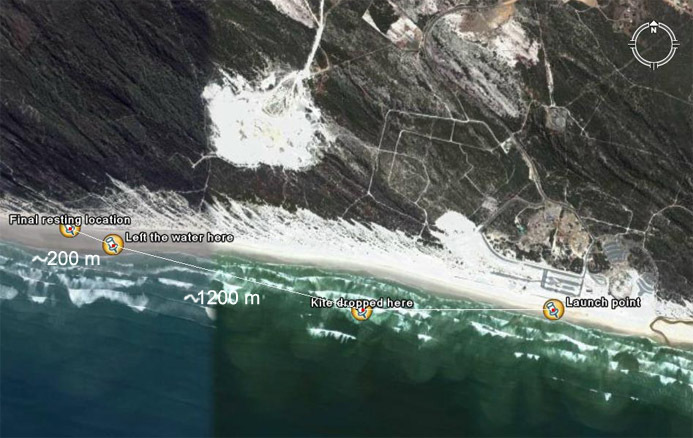 This process continued over a distance of approximately 1200 m (about 4000 ft.) and 200 m (660 ft.) up the beach at which point apparently the leading edge bladder of the kite ruptured. The rider may have activated his quick release in this process but due to a line tangle this may have made matters worse. He apparently was unable to release his leash attachment and set the kite free. 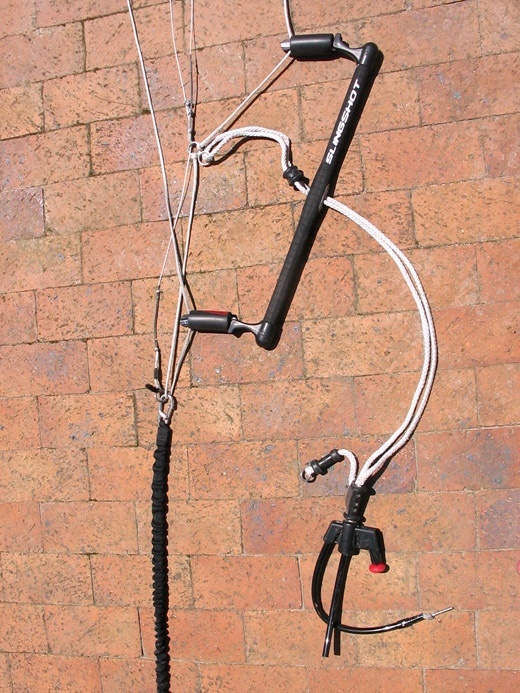 The kite control bar was found with one of the flat kites leader lines captured by the bypass leash snap clip. This would initiate a turn in the kite which would be maintained until either the kite was released completely or failed to continue to fly. The kite would loop repeatedly in a violent fashion, pulling the kiter through the water or perhaps even above the water in high speed bursts. There is precedent for such a line capture HERE and in other incidents. These events dictate avoiding the use of clips that open easily and capture flight/control lines. 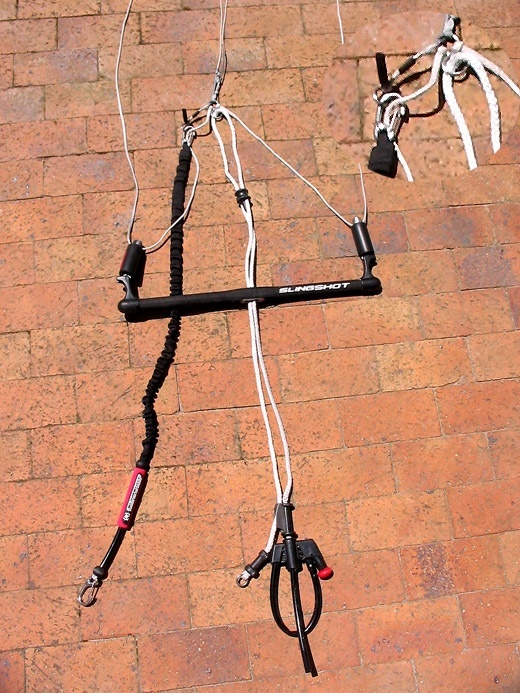 Upon activating the quick release, the kite apparently would have been steered into a radical turn by the uneven lengths of the flight lines. When other kiters arrived at the scene the rider was unconscious and not breathing. First aid was performed with no response. The post mortem concluded death was caused by a heart attack. Water was reportedly not found in the lungs and drowning was ruled out. My question is, is it reasonable to assume that a normal adult male, somewhat overweight would be at a significant risk of suffering a fatal heart attack under the general circumstances of this accident? I suspect his anxiety mounted substantially as the accident played out, perhaps augmented after activating the quick release. I am not necessarily looking for an opinion on a pharmacological basis for the heart attack given all the unknowns in the available information. I'll start by saying it is certainly possible to have suffered a fatal heart attack given his health condition, medication use and the stressful situation he unfortunately encountered. However, I suspect there may be more involved in this case. I really don't know if a complete autopsy revealed a myocardial infarction or was there simply a conclusion that he succumbed to a fatal heart attack after ruling out a few obvious other possibilities. So often we read a "cause of death" that is merely a diagnosis of exclusion; the true diagnosis wasn't actually made but makes sense after ruling out other likely possibilities. It isn't really known if a tissue diagnosis was made, and even if so, the infarction would likely be a secondary event in this case. If a myocardial infarction and actual coronary artery disease were found in a complete autopsy I would guess that this might even have occurred during resuscitative efforts. It is certainly very possible that he experienced some form of hypoventilation or even apnea prior to being reached by rescuers. His body habitus put him at greatly elevated risk of airway obstruction which at his weight leads to hypoxia very quickly...and hypoxia as well as catecholamine surges (adrenaline rush from fear/panic) could lead to a fatal arrhythmia very quickly. Although his lungs had no sea water by report, he may well have had laryngospasm, a protective reflex complete closure of the vocal cords which can occur with even a slight amount of water or other substance touching the cords. There are very many possibilities here, and being overweight and on an ephedra type drug greatly increase the chance of hypoxia and arrhythmia. My guess is that he encountered tremendous difficulties, anxiety, got banged around on the water plenty, may have "gotten the wind knocked out" of him, possibly developed some degree of laryngospasm, got dragged up the beach where he likely furthered his hypoxia, hypoventilation, hypercapnea with more airway obstruction and results of his body habitus and even possibly position/harness (waist harness more risky), and in a short time developed an arrhythmia from which he was not resuscitated. However, there are numerous other possibilities including spine-related or brain-related events. Of course none of this speculation can change what happened or even do much to prevent a future recurrence in another unfortunate person. Aside from the usual kitesurfing advice such as choosing when and where to kite, the only medical advice that might come from this or another incident would be to do everything possible to maintain an open airway and ensure adequate ventilation when encountering an unconscious victim. Big people, especially obese people, become hypoxic VERY quickly and are quite prone to fatal arrhythmias when this happens. Ventilation is critical. Anyway, I'd say that a "heart attack" is possible and most likely a secondary event in this case. My deepest sympathy for this man and all who will miss him in their lives. very sadden to hear about this unfortunate accident. Some mitigating factors can be the gentleman's physical condition, but this can happen to the most tip-top athelete as well..